Last week began the official start to the campaigning as the Dinosaur Party introduced its first candidate for election. Support was instantaneous, with several of you already prepared to vote for Phil A. Buster. Just remember though, there are yet 7 more potential leaders to come. Tomorrow will yield a very different voice with another strong message. Also a special thanks to Kal over at Cal's Canadian Cave of Cool for showing his support in This Post last week. This is a new party and it needs every bit of support it can get. I encourage you all to visit his site and show him some blog love. And If anyone else shows their support in a post, I will be more than happy to return the favor in future campaign updates. I'm also throwing out a request. If anyone knows how to make those badges for the sides of blogs that have the HTML for others to install on their blogs, I would greatly appreciate if you could help me out with that. I would like to get some support buttons for the Dinos. Thanks for your time and look for the next candidate tomorrow. Phil A. Buster sounds too Republican. I won't be voting for him. Sorry. I await the next choices. Ha! I love Phil A. Buster, too. I don't know how to make those button things, but I'm sure you can figure it out. 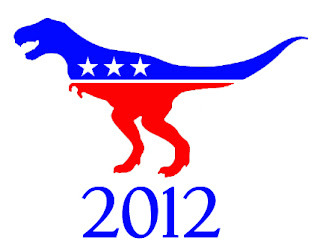 Somehow you figured out how to make the Dinosaur Party logo! One of my friends made me up my html code thingy for my button. I'm clueless in that department, too. I *think* the easiest way to do it up is to upload the photo to an account like photobucket and then create the code around that. @Belle, Earlier you said you'd vote for him. Et tu, Belle? @Kelly, Actually that graphic was done by my co-chairman of TDP, Reputation@Stake. Marlene, The code part is the tricky bit isn't it? I love how committed you are to politics....(snicker..) I can't wait to read about the other candidates. I could be good with Phil, really I could. As far as the button, I would like to know this talent too seeing as how I can't even sew a button on a shirt! Did I? Well, I am 61 so I have an excuse. Check out this blog post...should be helpful...will be back to snort at the next dino in queue. All right you convinced me. Tomorrow Dino will be blog and new blog of the day. Hope that helps your tea um Dino party. Phil is a tough candidate to beat.